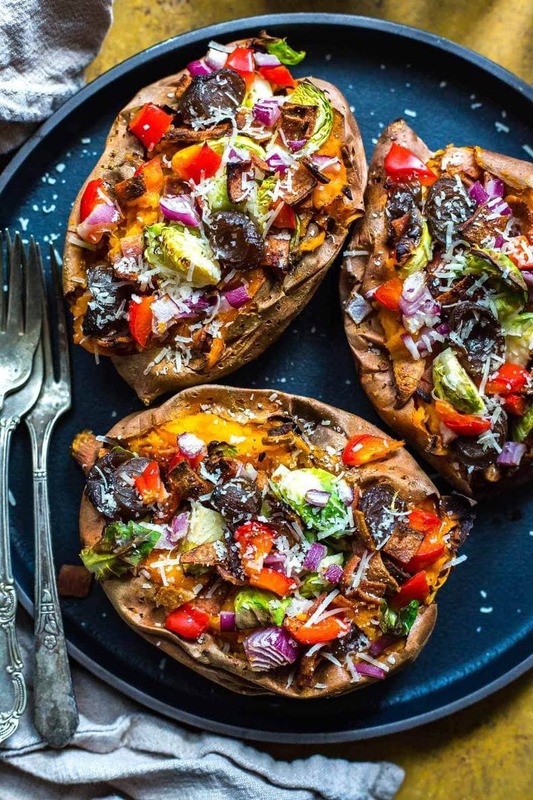 These Loaded Stuffed Balsamic Sweet Potatoes are a delicious and easy dinner idea filled with fall flavours like balsamic-marinated onions, turkey bacon and brussels sprouts. Preheat oven to 450 F. Prick sweet potatoes with a fork all over. Bake in the oven for 40-45 minutes until softened and tender. Meanwhile, prepare toppings. Remove sweet potatoes from the oven and stuff equally with veggies. Bake another 10 minutes. Remove from oven and sprinkle with cheese, then season with salt and pepper. Serve and enjoy! Note: sweet potatoes can be baked and kept in fridge up to 3 days ahead of time. Reheat in 425 F oven for 15 minutes, then stuff with fillings and bake for another 10 minutes, then serve.